Project teams have a lot to deal with on projects. They will have to navigate multiple problems, such as risks becoming issues, costs exceeding budget, and schedules slipping, on any given project. The top notch project managers and teams are skilled and experienced at coming up with innovative solutions to these problems. How can any project manager or team acquire this skill? In this post, we describe five ways to improve creativity on project teams to foster project management innovation. These steps range from building the foundation through organizational structure and culture to trying out agile practices. 1. Start with organizational structure and culture. The first step in fostering innovation in an organization is to make sure the organization is capable of supporting it. The organization’s structure and culture need to be examined to determine if the organization can support the necessary activities to promote creativity. For project teams, the ideal environment for creativity is likely to be a projectized organizationwhich is organized around projects and gives the most power to a project manager (Guide to the Project Management Body of Knowledge (PMBOK® Guide) Fifth Edition, Table 2-1, p. 22). Resources are already devoted to projects full-time, freeing them up to examine creative ways to deliver project solutions. On the other hand, when team members have to answer to their managers in a functional organization and return to their departments after each project, the split of work between projects and departments may stifle creativity. Another barrier to creativity may exist in matrix organizations, where functional managers and project managers share authority and resources; if the two sides clash, the conflict is likely to further stifle creativity. In organizations where the structure supports creativity among project teams, a culture supporting free communication and exchange of ideas without retribution is ideal. In organizations lacking an amenable structure, it is critical. In both cases, the lack of such a culture can derail efforts to improve creativity. If team members fear a negative response from management any time they suggest an idea, they are not likely to suggest any ideas. It is important to keep in mind that conflict doesn’t always stifle creativity. Sometimes, conflict can inspire creativity, as long as it is managed wisely. Conflict should not get personal, and it should also be welcomed rather than discouraged, especially when it does not get personal. In addition, even in a structure and culture that doesn’t support creativity, teams can still take positive steps to improve creativity, starting with stakeholder analysis as explained in the next section. 2. Make sure all stakeholders are represented. One of the keys to making sure that a project’s scope is complete is to make sure that the project’s stakeholders are all represented. Stakeholders that are not represented in project scope may derail a project later with changes that cannot be ignored. Therefore, the stakeholder group needs the right diversity to effectively contribute to project success. Likewise, a diverse stakeholder group can contribute to creativity. When stakeholders from all relevant business units are invested in a project’s success, they can all bring their perspectives to bear on a problem to find an innovative solution. The takeaway for project managers is to make sure all relevant stakeholders are accounted for and communicate with them to get their ideas on the project. By doing this, project managers lay the framework for their teams to benefit from diverse perspectives and build on existing ideas or contribute ideas of their own. 3. 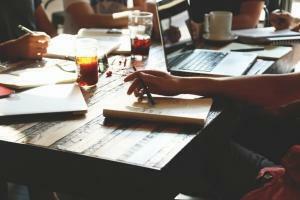 Use brainstorming meetings effectively. Brainstorming meetings are commonly used to generate ideas; unfortunately, some common practices in brainstorming meetings can stem the free flow of ideas. For starters, a brainstorming meeting should be devoted strictly to brainstorming, with other discussions moved to the side. If meetings are mixed, such as a brainstorming/information exchange or brainstorming/decision making meeting, participants may become confused and refrain from contributing ideas. Second, and most importantly, ideas generated during brainstorming should not be evaluated during the brainstorming meeting. Ideas can be evaluated at the end if using nominal group technique, or later, using another mechanism such as the Delphi technique or multi-criteria decision analysis (PMBOK® Guide Fifth Edition, Section 5.2.2.5, p. 115). During the meeting, though, all team members should have the opportunity to submit ideas before any are ranked, prioritized, or eliminated. Finally, one last tip for effective brainstorming meetings is to make sure they are not too long or short. One hour is ideal for brainstorming meetings; any less, and not all team members will be able to participate. More is doable, such as 90 minutes, but after that, participants may get fatigued. 4. Design team space to optimize innovation. The standard cubicle design for offices has encountered increasing resistance; at the same time, so has the open-office concept. How can organizations create space that enables project teams to improve their creativity? Open offices, where there are no walls and teams are co-located, foster communication by putting people physically next to each other. While this arrangement can inspire impromptu conversation that leads to idea generation, there are times where people have to work alone in order to come up with their best ideas and effort. Cubicles and other quiet-room spaces help people concentrate on their work; however, it can also make them feel cut off and contribute to silos of communication staying intact. By designing office space to incorporate each type of arrangement, organizations can reap the benefits of each type of space while avoiding the detriments. By having an office space that caters to their needs, whatever they are at the moment, team members can develop their creativity. 5. Borrow from Agile concepts. Concepts from agile methodologies, particularly Scrum, can help boost creativity on project teams. The idea of fixing time and cost and making scope flexible allows teams to work off of a product backlog, which contains any features that might enhance the value of the final product. The product backlog approach may be useful for teams struggling to define the full scope of a project. By using the backlog approach, teams can include all of the ideas generated at the start and then prioritize them to get the highest-value items on top. This way, no one’s ideas are excluded but the highest-value pieces get delivered. Another agile concept that can help contribute to creative thinking is the user story. A user story is a token for describing a feature or functionality someone wants in the final product. Each user story is written from the perspective of a person (for example, “As a user, I want . . .”), describes the feature (“. . . to be able to access email from my mobile phone . . .”) and finally, describes the benefit (“. . . in order to be able to work from anywhere.”) User stories provide a framework for teams to make sure they are not missing anyone’s perspective, and can also help them prioritize stories later by outlining what the benefit of a particular feature would be. Project teams need to be skilled at creative problem solving in order to navigate through the inevitable problems that come up on projects. Teams can improve their creativity by following project management and agile concepts, including effective stakeholder analysis and brainstorming meetings as well as use of product backlogs and user stories. Organizations can help teams foster creativity by providing welcoming spaces to do so through office design, organizational culture, and organizational structure. Such spaces inspire creativity on their own and also remove barriers for it to flourish. By taking action at both organization and team levels, organizations can reap the benefits of greater team creativity and develop their skill at delivering projects successfully despite any issues that might arise. RefineM’s leadership classes can help you build your skill at creative problem solving so you can train your team to do the same. These classes can also be delivered as customized training courses. 1. Project Management Institute (2013). Guide to the Project Management Body of Knowledge (PMBOK® Guide). Fifth Edition. Newtown Square, PA: authors. PMBOK Guide is a registered mark of the Project Management Institute, Inc.
Posted in Blog and tagged Agile, Leadership, Project Management, Project Management Innovation, Project Management Risks, Risk Management.